RePublic Schools, a Nashville charter school network, has announced a computer science event for students and teachers on May 20th. RePublic currently runs Nashville Academy of Computer Science, and it’s their mission to have more students of color take and pass the AP Computer Science exam. According to RePublic, only 48 students of color took the AP Computer Science exam in all of Tennessee. This year, 120 students of color from RePublic Schools took the AP exam. On Saturday, May 20th, RePublic will be hosting a full-day Computer Science event! The free CS extravaganza will feature a student hackathon for middle school students (5-8th grade), a teacher coding workshop, CS showcases of drones and robotics, and keynote speakers! No CS experience is necessary for the student hackathon as we will have mentors from the Nashville tech community floating to support students as they compete for prizes of drones, robots, and hands-on Littlebits sets! Teachers will build their first website during the free coding workshop, and learn how CS can integrate into classes. Earlier this week, I wrote about RePublic Charter’s unsolicited emails to teachers in a district outside of Nashville. Since then, I’ve received a version of an email sent to teachers in MNPS attempting to recruit them to teach at RePublic. Reimagine Public Education in the South. We’re doing the work where others aren’t – in parts of the country where educational inequity has the deepest roots. We’ve got a reputation for challenging the status quo. RePublic’s are some of the highest performing public schools in the state of Tennessee. Ours were the first charter schools to open in Mississippi history. We’re teaching thousands of kids to code – inside and outside the walls of our schools. Where others are limited by what has been – we’re inspired by what could be. Working at RePublic isn’t just a job. It’s a movement. It’s a family. It’s a community of staff, students, andfamilies who stop at nothing to ensure that every one of our scholars is prepared to succeed in college and life. With extensive professional development, coaching, content training, and teammates who will have your back with equal parts love and honesty – you’ll be among the best, and thus, become your best. Pave Your Path – and Make Your Mark. We’ve got ambitious plans to serve hundreds more kids across the South next year – and are searching the nation for top talent for roles in teaching, operations, culture, school leadership, and on our network team. As a stakeholder in an organization that is growing quickly, you’ll have the chance to help build something extraordinary. Want to learn more about opportunities to join RePublic’s team next year? Request a meeting with our Talent Team here. Included in the email was a video of a student named Kendreanna. The pitch? Kendreanna and students like her need teachers — like those that are already working in MNPS and other districts. My questions remain: Is this a typical recruiting tactic? Do other charter operators send unsolicited mass emails to teachers begging them to apply for jobs? Do district administrators engage in this type of recruiting tactic? I hope you don’t mind me reaching out– I work with RePublic Schools, a network of high performing public charter schools based out of Nashville, TN and Jackson, MS with a mission to reimagine public education in the South. We’re #BuildingOurBracket for 2017-18 at RePublic. We’re stacking our roster with A-Players from across the nation to lock arms with our teams in Nashville and Jackson to reimagine public education in the South. I’d love to talk about your plans for next year – and why we think joining our family would be the jumping off point for the next phase of your leadership pathway. Do you have 20 minutes to jump on the phone re: 2017-18? Shoot me a few times that work and the best number to reach you – and we’ll get it on the books. In the meantime, I thought I’d share a few resources to help you learn a little more about RePublic – you can hear from the #PeopleOfRePublic (our staff members, our kids), check out our results here, and learn more about what’s important to us on our blog. This message is an advertisement. If you do not wish to receive future emails, please let us know. The disclaimer at the bottom describes the recruiting email as an advertisement. The message was sent to the school emails of many teachers at school near Nashville. It’s not clear whether this is a typical tactic of RePublic’s. It’s difficult to imagine one public school district sending emails like this to teachers in another district via the school system’s email. Sure, principals and directors maintain contact and reach out to individual teachers, but sending a mass email to nearly every teacher in a single school asking about their teaching plans for the following year? These emails were unsolicited. None of the teachers who shared an email with me had previously expressed any interest in RePublic. What happened next didn’t resemble collaboration at all, but rather outright hostility. As it turns out, many of those who signed on didn’t really care about public schools. Their sole focus: Expanding the taxpayer-funded private schools known as charters. For example, just two years after signing the compact, then-mayor Karl Dean, who’s now running for governor of Tennessee, roamed the halls of the legislature pitching lawmakers on a bill to strip local elected school boards in Memphis and Nashville of our ability to reject charters, which drain resources from existing schools. Dean’s legislation, which became law, instead gave the appointed State Board of Education the final say-so on charters – even though, here in Nashville, local taxpayers fund two-thirds of K-12 public education and the state is a minority investor. Later, Dean went on to launch Project Renaissance, an anti-public education group funded by backers of charters and private-school vouchers, which would further drain our public-school system of finite resources. In 2016, Dean’s group tried but failed to defeat incumbent Nashville School Board members at the polls – less than three months after the board hired an energetic new director of schools who articulated a big vision. Another compact signer, Randy Dowell, CEO of KIPP Nashville charter schools, ditched the pretense of collaboration as soon as he saw an opportunity to ramrod new charter schools through the State Board under Dean’s newly minted law. Meanwhile, this year Dowell is effectively booting 43 MNPS students from Nashville’s Kirkpatrick Elementary School because they don’t fit in his business plan for a gradual conversion of the former public school. Speaking of Kirkpatrick: Marsha Edwards, another compact signer and CEO of a pro-charter nonprofit group, somehow managed – after zero collaboration with the school board – to secure federal funds to build a new charter school right next door to Kirkpatrick. This will have a destabilizing effect on both schools. Last year, Edwards put her organization’s federal tax-exempt status at risk by partnering with Stand for Children, which has become a radical reform group, in failed efforts to upend local school board elections. Jeremy Kane, a politician who finished last in Nashville’s 2015 mayor’s race, also signed on to the compact. Kane founded the local LEAD charter chain, which later declared war on MNPS when it sidled up to the failing state-run Achievement School District, which engineered a hostile state takeover of Nashville’s Neely’s Bend Middle School – a school that already was turning around. Finally, Ralph Schulz, CEO of the Nashville Area Chamber of Commerce, was another compact signer. The business group, a longtime mouthpiece for charter special interests, supported Dean’s law to punish local school boards and has even endorsed vouchers. Schulz and the chamber enthusiastically joined last year’s failed efforts by Dean and others to blow up the school board and MNPS – so perhaps some collaboration was happening, after all. These days, the Center on Reinventing Public Education, which attacked the Nashville School Board in 2013, is now ideologically aligned with President Trump and U.S. Education Secretary Betsy DeVos – and it’s pushing local school systems to recommit to charter compacts of the past. My view: If the turmoil of the past seven years in Nashville is any indication, I’d say we’ve had enough so-called “collaboration.” I’m guessing other school systems have had similar experiences. A Tennessean editorial by 374 Nashville parents demand that attacks on charter schools stop. The editorial, which was delivered as an open letter to Director of Schools Shawn Joseph and Board Chair Anna Shepherd, includes parents from 19 charter schools in Nashville. We are coming together to say that the attacks against our schools must stop. Many parents in Nashville exercise school choice by moving into zones of high-performing schools or by entering the lottery and hoping for seats in choice schools. As parents of students attending public charter schools, we are no different. Our zoned schools were not able to meet the needs of our children, so we found schools that do. Yet we find ourselves and our schools on the receiving end of constant accusations and attacks. In education, we know that we must meet the individual needs of our students. The same is true for parents. They want to pick a school that meets the needs of their child and family. That could be a zoned school, charter school, magnet school, or a private school. They know what’s best for their child. We shouldn’t fault anyone for that. We must all come together to make our district better. That includes charter schools, magnet schools, and zoned schools. All are responsible for making collaboration key for our students. I’ve even seen collaboration between private schools and MNPS. Division may gain you retweets, but it won’t help our students. Collaboration will. In this age when too many elected officials delight in drawing divisions rather than doing the hard work of solving problems, we hope you will reject that path and instead come together to focus on the opportunities and challenges in all of our city’s public schools. We urge you to cease these attacks on our schools and show the city of Nashville that you are a productive, student-centered board focused on making every MNPS school excellent. Contrary to the picture some board members paint, we are intelligent, engaged, determined parents who want a better life for our children. All parents want what is best for their children, and we are no different. Our children are thriving. They are working hard and learning every day. They are encouraged at school to dream big, and they are receiving the education they need to reach those dreams. While each of us has a story of why we chose our public charter school instead of our zoned school, we wish every Nashville school well and are thankful for the hard work of this board and the progress you have made over the past year. We ask that you continue that progress by focusing your positive energy on all of our city’s public schools instead of singling out a few. These 374 parents are public school parents, and they are fed up with the attacks on the schools they decided to send their kids to. We spend too much time shaming parents for picking charter schools or private schools. Shouldn’t we be asking why these families are picking private and charter schools? Let’s find that answer, and then let’s move to make the changes that are needed. I’ve heard from parents who transferred their student with learning differences to a private school to only get shamed from their friends. The same has been heard from a parent who found that a charter school served their student with learning differences better than their zoned school. As a special education teacher, I can’t fault any parents for picking what is best for their child. Let’s listen to all public school parents, not just those from zoned and magnet schools. You can read the editorial and all 374 signees here. Let’s see: 9,718 students in Nashville charter schools. Which means there are 9,344 parents who didn’t sign on to the big letter. Sad! When hundreds of parents come to the school board with an issue, it shouldn’t be dismissed by a school board member in a Trump-like tweet. That’s not the leadership that our city deserves. MNPS Board Member Will Pinkston argues in today’s Tennessean that Nashville’s charter school industry is unraveling. To make his case, he cites a federal class action lawsuit against RePublic charter schools, a state finding that Rocketship isn’t following the law when it comes to serving students with disabilities and English language learners, and a significant financial deficit at LEAD Public Schools. Despite failing to serve its current students, Rocketship routinely makes end-runs around the local school board to seek state approval of more charters. That’s because Rocketship’s growth isn’t driven by what’s best for kids but rather by its real-estate deals with Turner-Agassi Charter School Facilities Fund, a for-profit investment fund co-managed by tennis star Andre Agassi. Taken together, Pinkston says, the problems faced by these three charter operators show an industry not living up to its hype. While some call it a distraction, the charter debate is alive and well in MNPS. I’m excited to announce that “Backpack Full of Cash” has been selected for the Nashville Film Festival! My children, their teachers, and I participated in this documentary, and although I’ve not yet seen it, I believe it will provide an eye-opening view of the school privatization movement affecting Nashville (and our state as a whole), as well as other urban areas across the country. The film, narrated by Matt Damon, focuses on market-based education reform and its impact on public schools. Tuesday, April 25, 2017 at 5:30 pm. Join me for a screening (and possibly a Q & A following the film). This should be a timely and informative film! Actually, it’s a 90-minute documentary about the real and ongoing movement to privatize public education and its effects on traditional public schools and the students they enroll. 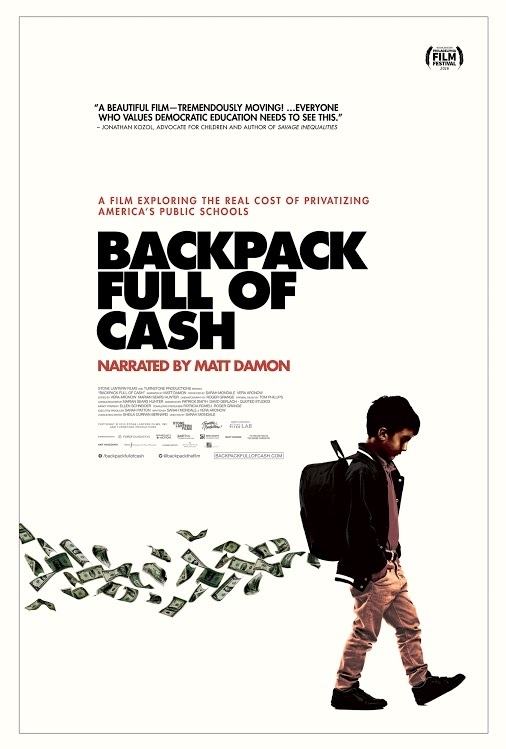 With actor and activist Matt Damon narrating, “Backpack” tells a scary but important story about corporate school reform policies that critics say are aimed at destroying the U.S. public education system, the country’s most important civic institution. So, two dates in April offer a chance for those in and around Nashville to check out this important film that also features an MNPS Board member. TC Weber seems to think so. He outlines the Denver-Nashville connection in his latest post. According to his analysis, the move to a Community Superintendent model in MNPS is strikingly similar to what’s happening in Denver. Now here is where it gets even trickier. As part of its “Denver Plan,” DPS has set a goal of 80% of all students attending a high quality school by 2020. In order to do that within the next three years, they don’t have a lot of time to wait for schools to improve. So Denver employs an aggressive policy of closing schools and replacing them. Replacing means they keep the school buildings, but rehire all new staff and administrators, refocus the curriculum, and then open new schools. Since 2005, they have closed or replaced 48 schools and opened more than 70 new ones, the majority of them charter schools and right now, due to the Trump presidency and the new tone in Washington, charter chains are seeing an opportunity. Think about some of Nashville’s chronically underachieving schools and then apply the Denver Plan to them. It’s important to remember as well that demographics play a role in performance. 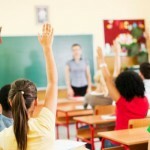 Attract the right kids and the school appears to perform better. With parents having a choice between schools in the enrollment zones or the community zones, competition will become even more heated than it is now. And it’s hard to predict who the “losers” will be. Read more from TC about Nashville, Denver, charter schools, and distractions. According to the Metro Schools letter, Rocketship is not providing services to children with special learning needs, like English language learners and students with disabilities. The notice was sent from Metro Nashville Public School’s top administrators after a monitoring team with the Tennessee Department of Education came in to conduct a routine audit of special services, primarily programs adhering to The Elementary and Secondary Education Act (ESEA) and The Individuals with Disabilities Education Act (IDEA). The letter from MNPS notes a plan of improvement for Rocketship. 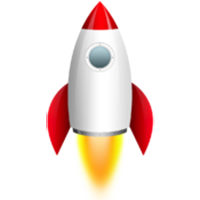 Rocketship has faced difficulty with the state and MNPS in the past, as in two consecutive years it sought to expand its presence in Nashville only to be denied by both the MNPS school board and the Tennessee State Board of Education. In summary, with no additional state accountability data to consider, and no compelling evidence presented that provides confidence in the review team, converting an existing low-performing school before Rocketship has demonstrated academic success on state accountability measures would not be in the best interests of the students, the district, or the community. As was noted in the WSMV story, the problems identified at Rocketship are not acceptable at any school, regardless of what kind of scores they are posting. Mitchell and his colleagues should work quickly to deliver on the promise of resolving these issues and striving for continuous improvement.